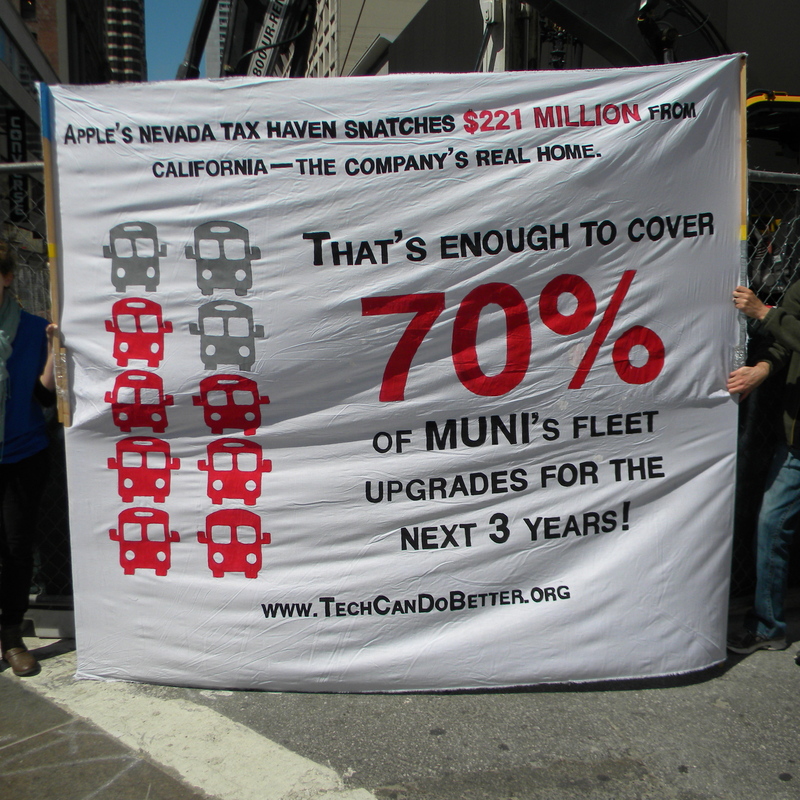 SEIU, United Service Workers West, organized a tax day community event outside the Apple flagship store off Market Street in San Francisco. Photo by PMWG staff 2014. SAN FRANCISCO – Service Employees International Union-United Services Worker West kicked off a series of demonstrations today to raise awareness about corporate profiteering at the detriment of tax payers. SEIU’s demo focused on Apple’s flagship store off Market Street in San Francisco. Members of the community were invited to participate in what SEIU called a “bogus $15 billion mail-in rebate” offer. 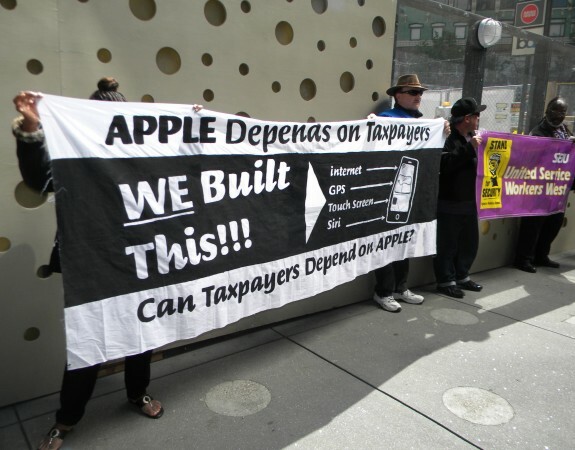 According to SEIU, Apple has sent over $100 billion to offshore accounts, and that the portion attributable to Bay Area profits amounts to $15 billion. By bringing that $15 billion home, about $5 billion in tax revenue would be generated. Read more by our member Ellen Huet at SFGate. The SEIU points out that Apple benefits from a “world class infrastructure” built by American and Bay Area taxpayers, that Apple relies on every day to generate profits. Said infrastructure includes highways, bridges, and public transit as well as schools, universities, satellite systems (for GPS), courts, banks, stock markets, telecommunications, patent protection, and scientific, computer and internet research. SEIU claims that Apple’s profits have risen 5,209 percent from 2000 to 2012, or to more than $41 billion per year, due in part to support from public resources. Meanwhile, median worker income in Silicon Valley has fallen by 12 percent during the same time period. The middle class is shrinking. The public resources depended upon by communities – police and fire protection, Medicare, Medicaid, Social Security, food stamps, unemployment insurance, disease control, and public housing have all been depleted. Pacific Media Workers Guild staff joined about 30 SEIU members and other activists in front of the flagship Apple store, and helped hand out $15 Billion “mail-in” rebate cards, urging workers to claim a fair share of Apple’s prosperity. More information can be found at techcandobetter.org. Additional demonstrations occurred outside of the new University of the Pacific dental center near Fifth and Mission, led by Janitors for Justice, and outside the Twitter headquarters on Market Street. The Twitter action included a march from Market Street to City Hall, led by SEIU 1021. According to 1021, San Francisco’s tax breaks to Twitter is a loss of $56 million in tax revenue to the city. Business interests point out that without the tax breaks, Twitter wouldn’t have come to the City in the first place. For more on the battle of workers’ interests vs. big business, read here.